Prevent Falls in Your Daytona Beach Bathroom- Bathroom falls in Daytona Beach, Florida are common, and the frequency is increasing each year. Falling threatens an individual's health and independent living. Falls can significantly impair a person's ability to remain self-sufficient in their own home. The Center for Disease Control reports that 1 in every 3 adults over the age of 65 falls each year. Over 25% of these falls result in moderate to severe injuries that include bone fractures, brain injuries and internal injuries. Most falls happen within the home. All of the staff at Independent Home Products, LLC are caring experts in bathroom safety. The safety of our customers is our number one priority as we design and manufacture walk in bath tubs for Daytona Beach, FL residents. 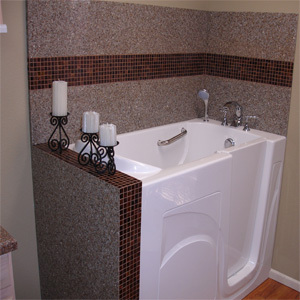 Each walk in tub is custom molded in our own facility to fit your needs. Wider models are available for full figured clients. 5★★★★★ - "Independent Home did a great job. The two contractors they sent a month ago were nice and good guys. I would recommend them, they were great." 5★★★★★ - "My son, Chris, got a walk-in bathtub from Independent Home and I saw it. I then compared it with others to see if it’s as good as his. I called Cameron, the tech guy and he took care of the purchase right off the bat. The installation team came in at eight o'clock and was out by 1:30. They worked as a good team and had to work with me because I have an electrical door and we had to move it out. They did a good job and I'll definitely recommend them." 5★★★★★ - "We got a Celebrity bathtub as that was the only one that would fit. I had no problem purchasing it and the experience wasn’t too bad. The people who came over to install it were knowledgeable and courteous. They came and did what they had to do and everything went alright. They were around for about 12 hours that day. They left a bit of mess but I had somebody clean it, anyway. They also had to cut a section of the wall out to get the tub in. I’m just waiting for them to come over and take care of something, but other than that, I don’t have any problem with it." 5★★★★★ - "I had talked to someone a couple of years ago to have walk-in bathtub installed in my parent's mobile home and I was thinking that Independent Home might have been the same dealer I dealt with before, but as it turned out it wasn't, so it's a fluke. I found about Independent Home on the internet. My experience with them was pretty straightforward and easy. Their installation team was awesome." 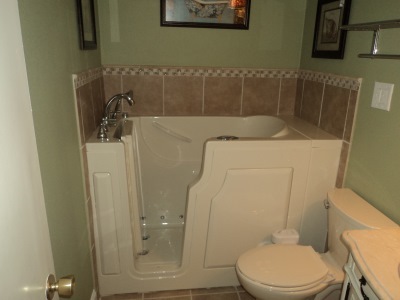 5★★★★★ - "Indpendent home has a nice wheelchair accessible walk in tub that works perfectly for me. Bathing is so much easier now!" 5★★★★★ - "Can't say enough good things about these guys. The even did some nice tile work and added some other safety grab bars in my bathroom. I love my walk in tub!" 5★★★★★ - "My father just turned 75 years old so we purchased the walk in tub from Independent Home. Best price, quality and warranty." "I was having muscle pain and really wanted to take a bath again. I was unable to bath for over 20 years and use my walk in tub 4-5 times a week. I can now relax and enjoy bathing without worrying about falling." 5★★★★★ - "I had my Celebrity Model walk in tub installed and am loving it! I wanted to use the tub as a shower and had glass doors put on. This was the tub she dreamt about! This is right hand door configuration with an acrylic wall surround. I had a 1 piece tub and shower that they replaced in just 2 days."